The oceans are in serious trouble. Stocks of commercially important fish have collapsed in many areas. Reefs have been dying at an alarming rate. The water is warming and acidifying. Ecosystems are shifting in unpredictable ways. Click highlighted links in the list below to find out more information on some of these crises. Fisheries Collapse: The collapse of major fisheries is well underway, forcing countries to go after deep-sea fish, which are far fewer, slower growing, and often of less nutritional value. For example, the orange roughy was discovered in large numbers off New Zealand in the 1980s, and now in the Indian Ocean, around deep-ocean seamounts. The fish were caught in huge numbers near New Zealand and nearly wiped out, since they reproduce slowly. In fact many of the fish eaten were many decades old. The same thing is happening in the Indian Ocean now . SEE Monterey Bay Aquarium's SEAFOOD-WATCH page for endangered seafood species. and: Island nations are in danger of disappearing due to global warming. 40 miles off Monterey, CA. Acidification: The other CO2 problem: CO2 forms carbonic acid when it dissolves in water. This is already starting to affect marine life; for example, acid dissolves calcium carbonate, the mineral of seashells and corals. See this news story . Deep-Sea Trawling: Trawling by fishing boats is causing severe damage to many habitats , destroying unique and sometimes rare species. Click here for a June 2005 article by Greenpeace on attempts to stop this. Click here for a Jan-2006 story on severe decline in deep-sea trawled species: deep fish including grenadiers are rapidly being depleted by fisheries. 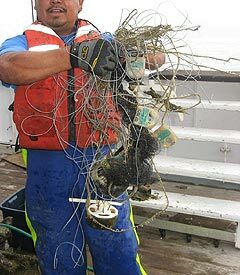 - In 2009 , a submersible survey off California found recreational fishing gear to make up the majority of the debris! - In 2010, a garbage patch was found in the North Atlantic. Low Frequency Active Sonar: New evidence has arisen that the navy's testing of its Low Frequency Active Sonar can trigger mass beaching and dying of whales. See Epipelagic page for the most recent evidence (scroll to the bottom of that page. See also the 26-Jan-01 issue of Science p576. Oil spills and other chemical pollution: March '99: a grounded ship on the Oregon coast was towed and sunk to the abyssal plain with tanks of fuel oil. See the the website on the New Carissa disaster . Ozone hole over Antarctica is letting in excess UV light; 2006 evidence shows that this is affecting the marine ecosystem . Is there any hope? Recent studies on MPAs (Marine Protected Areas) show that setting aside such reserves can help restore fisheries in nearby waters. Information on other efforts can be found below. • 2006 News: President Bush signs bill to create world's largest coral-reef reserve / MPA (Marine Protected Area). • 2009 News: New studies show that properly managed fisheries can recover! • 2010 News: Congress passes a ban on shark finnning! 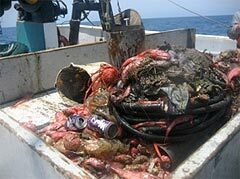 Deep sea trash from near San Diego.